Smartwatches never won me over. I’ve never found a real reason to wear one. As smart bands have started to take off, I’ve started to think about this kind of wearable. I thought of using one to see how useful it actually is. My first experience was with the Honor Band 3. Read on to find out how it went. Do you need a smart band or a smartwatch? At first glance I thought it would fit on my wrist. The main problem with smartwatches, as far as I’m concerned, is that they’re too big and heavy (I don’t want to talk about their limited intelligence if you use them without a smartphone). The Honor Band 3 isn’t too large: at about 18 grams, most days I forgot that I was even wearing it. Before I had the Honor Band 3, I had considered the Xiaomi Mi Band 2 for the same reason: it’s small (compared to similar fitness bands like TomTom Spark) and it’s also cheap. Price was the other determining factor for me: right now you can buy the Honor Band 3 for only $59.99. I don’t exercise daily, but I do occasionally (I promised myself to go to Body Combat three times a week, but in the end I only set foot in the gym once). I’m not obsessed with monitoring the kilometers I’ve traveled, calories I’ve consumed, and my heartbeats. But yes, I’m intrigued by this world of numbers. That’s why I’ve become curious about using a smart band. Just press on the two pins to close the plastic strip, which can be comfortably and safely engaged. It’s impossible to lose the Honor Band 3, since the clasp is tight and the strap is a single component with a display. Place it tightly on your wrist to make sure you keep your heart rate under control. I left the Band 3 on my wrist even when I was sleeping to allow it to monitor my sleep (and I have to admit that this was one of the functions that most intrigued me) and I practically forgot that I had it on. But first I had to set the device to the Do Not Disturb mode, which stops you from receiving call and message notifications as well as prevents the screen from being activated with every wrist movement. The Honor Band 3’s battery is what made me forget about that the device was on my wrist. Honor promises a month of autonomy but as with smartphones, this all depends on how you use it and how many notifications you receive. I can tell you that I didn’t have to start charging it until after two weeks of using it, and I received many WhatsApp, Facebook and Gmail notifications with the device. Why two management apps instead of one? One thing that confused me at first was the use of two management apps. 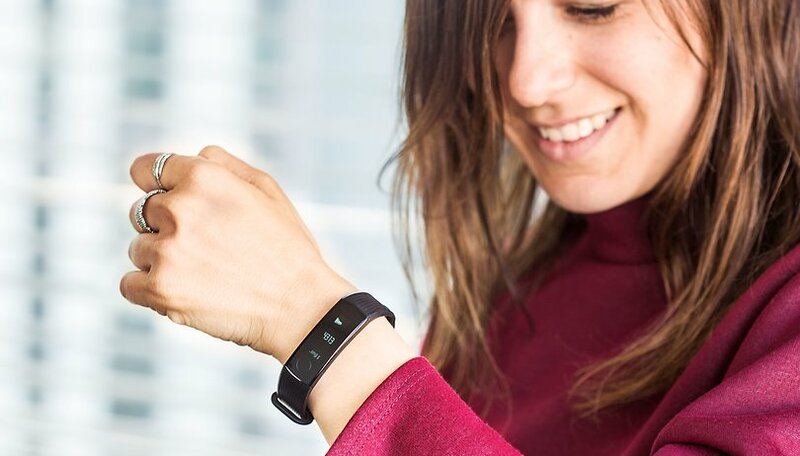 You need to install Huawei Wear to connect the wearable and manage some items, but it’s the Health app that shows the detailed data with lots of statistics and training programs. Why not do it all with a single app? This doesn't make things too complicated, because you can also access Health directly from Huawei Wear, but I think it'd be easier without this extra step. I found the Health app to be well designed and easy to use. You’ll find the steps you’ve taken at home, the amount of distance you’ve traveled and calories you’ve consumed at the top. There are different sections dedicated to exercise (you can start a workout choosing between activities such as running outdoors, treadmills, walking and cycling) or you can create a personalized plan and monitor your sleep, weight and heart rate thanks to the sensor. Honor uses M4 core technology and shows heart rate zones in the app to improve workouts. It’s actually you who decide which categories are displayed on the screen when you log in. I would not spend more than 100 dollars on a smart band. The Honor Band 3 consists of a long display, with which you can interact from the integrated circular key at the bottom. Simply place your finger lightly to move to the next screen, reject an incoming call, or postpone the alarm. It’s definitely convenient, especially with the alarm clock! The screen is small, so don’t expect to be able to read your WhatsApp messages or emails in full, unless the text is particularly short. The display is still convenient because it shows little information, but it’s useful for knowing what’s happening on your smartphone. You can see the sender or the WhatsApp group, subject, sender, or part of the email received. The display also shows the number of steps you’ve taken, the heart rate, and from there you can start monitoring your run or swim. The Honor Band 3 doesn’t integrate GPS, but if you have a Huawei/Honor smartphone with EMUI 5.0 or later you can take advantage of your smartphone. Among the incoming notifications, there is also one with an icon of a little man on the move: this figure means that it’s time to leave your chair or sofa and move a bit! As I mentioned, I was particularly curious to test TruSleep for sleep monitoring. The smart band allows you to keep track of light, deep and REM sleep and also indicates how many times you woke up during the night. I found this feature to be imprecise: the data often showed that I had slept without interruption, when in reality I woke up even though I didn’t get out of bed. With this doubt, I borrowed a Fitbit Ionic Adidas Edition from my colleague for an evening, and went to sleep with two wearables on my wrist. Sleeping perfectly with these two devices was certainly impossible because the Fitbit is rather large. In any case, I was immersed in my experiment and the following morning I looked at the data: the Honor smartband reported only one instance when I woke up, and the Fitbit found 4 instances. And the Fitbit app also offers more details by specifying the total duration of time when I was awake. I don’t want to compare the two devices because they’re in two completely different price ranges, I just want to say that the Honor Band 3 can provide a good overview, but doesn’t give you detailed information. It might’ve helped if I had tightened the smart band further, but I don’t think that’s the problem. You should take it, without a doubt, especially because of reasonable price. The Honor Band 3 finally won me over, and I decided to start wearing it on my wrist. I’m not looking for a wearable device that can monitor my (limited) physical activity in great depth. I don’t think it’s worth spending more than 100 dollars on a smart band, now or in the future. Would I recommend it? It all depends on you. Yes, if you’re looking for a cheap device and you simply want to monitor your running, walking, cycling, or swimming. If you’re a yoga type maybe this device wouldn’t make much sense for you. I would recommend this device if you’re a beginner with this type of wearable and you just want to have your heartbeat under control or monitor your hours of sleep and steps. All in all, I would say my experience with the device went more than well! Do you use a smart band or smartwatch? Is there anything that’s missing for you in this type of device? Which wearable is best for you? Choose “Smart band” or “Smartwatch”.